When anyone thinks about New York City, fixtures like concrete sidewalks, skyscrapers, large office buildings, heavy traffic, storefronts, and subway stations come easily to mind. Green spaces are generally relegated to designated city parks, and most flowers are pre-cut, bundled into ready-to-go bouquets. However the metropolitan topography is changing. 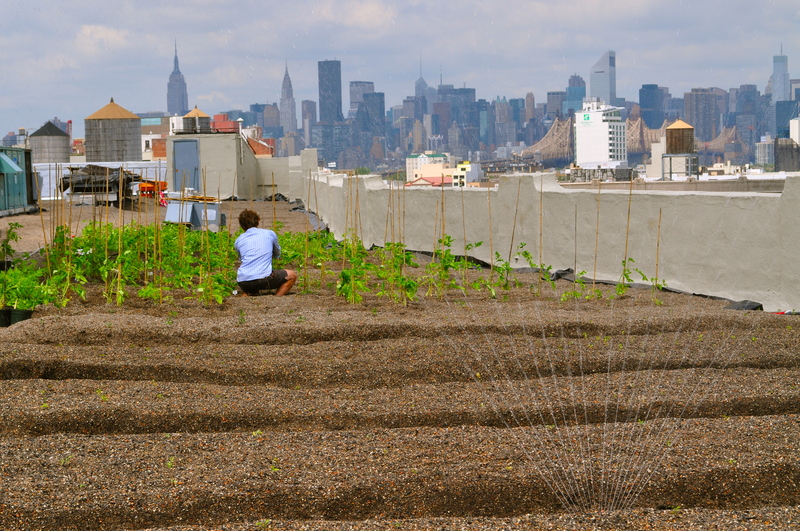 Urban farms are popping up across the city on rooftops, in church basketball courts, and backyards. They are finding homes in otherwise abandoned spaces reclaimed by ambitious, enterprising, and entrepreneurial souls. These urban farmers are eager to take advantage of what they see as a common-sense solution to feeding local, seasonal produce without the carbon footprint to a hungry city. They are also looking to the future. In neighborhoods where you can live next door to someone for 20 years and never know their name, these urban farmers are committed to building community while at the same time expanding production and earning profit. Located in Long Island City, Queens, Brooklyn Grange is one of the newer additions to New York City’s growing urban farms movement. It is also the largest. At 40,000 square feet — a little less than an acre — the Grange is the first commercial farm in the city that has enough scale to support a full-time staff. “We’re kind of unique in that, almost stubbornly, we want to make it a real farm,” Flanner said. Flanner belongs to a new breed of urban farmer: motivated, autodidactic, curious, adventurous, and city-smart. These are traits shared by other urban farmers, essential characteristics that equip them to navigate a terrain both less complicated and more challenging than a traditional commercial farm. 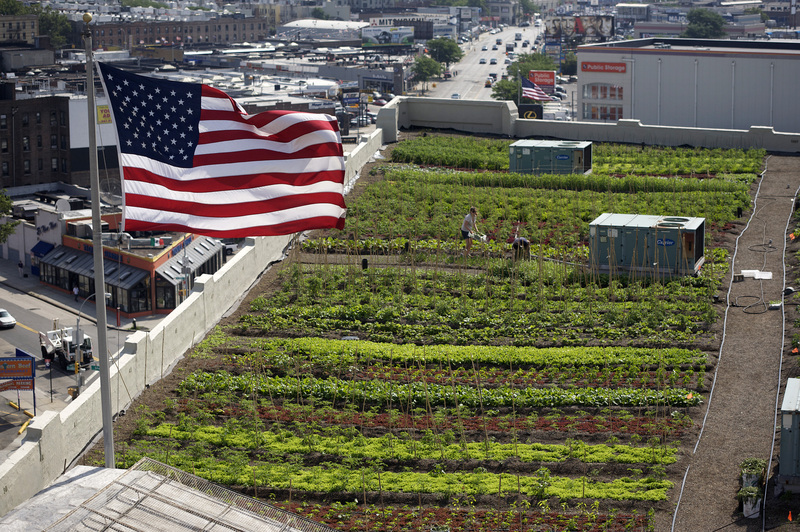 As a rooftop farm six stories above ground, Brooklyn Grange’s growers must think outside of the box in order to work around factors unique to their environment. Creativity is the key to growing in the city, something that Jordan Hall and Bennett Wilson of Tenth Acre Farms know well. Hall, Wilson, and Wilson’s brother Adam are the three owners of New York City’s newest commercial venture. Beginning as a project in Hall’s backyard in 2009, the farm expanded last year, taking over a little-used ground space in the back of St. Cecilia’s Church in Greenpoint, Brooklyn. The agricultural space that they carved out of the middle of hipster Brooklyn is impressive, sophisticated, clean and elegant. Using the skills and knowledge gained from experience in set-building and scenic design, they came up with the idea of “raised bed gardening” instead of planting into the ground. “You just can’t bet on most of the soil in Greenpoint and Williamsburg. You don’t know what contaminants are in there. We knew we had to get new soil. Instead of digging in, we figured it was going to be much easier to build a structure where it can be raised off the ground,” said Hall. According to both Hall and Bennett Wilson, raised beds offer many advantages: they increase your growing season and keep pests away. There is no damage to any root structure because a foot never touches the soil. Harvesting is easier because you don’t have to bend down. “It benefits the plants in so many ways that it is worth that initial input. And it’s somewhat cosmetically pleasing on a lot of levels. Where there is going to be shared property, we thought this was the right way to go,” Hall said. 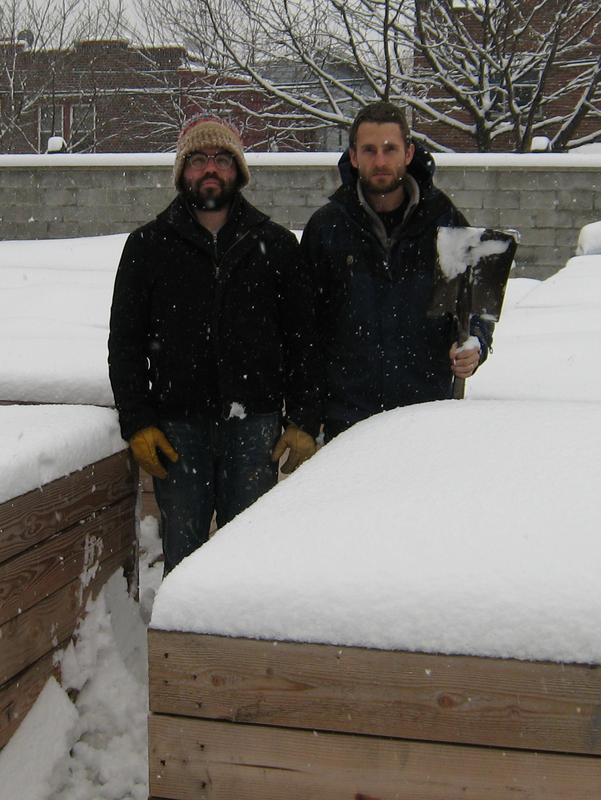 For Hall and Wilson, one of the biggest challenges to any urban farm is space. Not just limitations on how much space to give the plants, but also space to compost in order to fully realize the goal of farming using organic practices. Both farms are composting as much as possible, avoiding pesticides, fungicides, and chemical fertilizers. Tenth Acre Farms openly accepts compostable donations from the community. Flanner collects scraps from farmers’ markets, coffee chaff from a local roaster, and pure wood shavings from a nearby woodworker. For Flanner, maintaining healthy soil is the key to staying successful. However, the difficulty of this task is compounded by logistical aspects unique to urban locations. In the case of Brookyn Grange, delivery of new soil, compost, and compostable materials are limited by what the growers can bring up to the roof. However, urban farming does have distinct advantages. 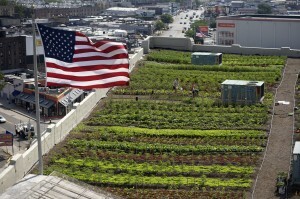 For one, urban farms are literally in the market’s backyard. Their proximity to New York City’s restaurants, farmers’ markets, and CSA’s ensure that the consumer is never more than five miles away from the farm. Wilson points out other positive points: by eliminating the middle man, an urban farm of 2000 feet like Tenth Acre Farms can actually net as much profit as an 8000 square foot farm elsewhere. “We don’t have to pay a shipping company, a packaging company, or a wholesaler. We have the costs of big machinery,” he said. Another challenge to any farm, not just urban farms, is distribution. How do you connect with the consumer? How do you find channels to move harvested produce and build the infrastructure needed to deliver perishable goods? How do you educate restaurants and customers to know what is seasonally available? Brooklyn Grange and Tenth Acre Farms both have established markets that they run and maintain throughout the season. In addition to these, both will have Community Supported Agriculture (CSA) operations this season. They will be Tenth Acre’s first, and Brooklyn Grange’s second. In addition, Brooklyn Grange supplies several restaurants in the city. Last year, Tenth Acre Farms began developing relationships with local establishments — restaurants, cafés, and bodegas — to move more of their harvest. According to Flanner, Brooklyn Grange produced 12 and 14 thousand pounds of produce last year, even with a shortened growing season. They sold almost all of it. For Tenth Acre, the farm’s inaugural production exceeded all expectations — about 7 or 8 thousand pounds. Still, Wilson projects that the farm has not yet reached its full potential. Wilson spoke of experimenting with mirrors in order to direct sun to shadier areas of the farm, as well as building cold-frames to extend their productivity. This spring, he will work on the farm full-time (Hall and Wilson both currently work for College Humor, a comedy website). “I think after this year, we’ll blow people away. Now that I can devote more time, I can go out there every day and work the place. It’s not like I have to pick everything, deliver it, and then get back to my job,” he said. Currently, all acknowledge that there is a certain novelty to what they are doing. Flanner does make the point that even given phenomenal growth, urban farming is not a replacement for local farming upstate and elsewhere. 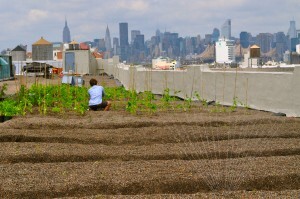 Citing statistics, he notes that if urban farmers were to cultivate every available space in New York, the appetite of city’s 8,000,000 residents would exceed any supply. For both farms, there is still room to grow. Brooklyn Grange has a ten-year lease on their rooftop, and Flanner is looking to the future with an eye to experimenting, learning, improving, getting smarter, and diversifying. 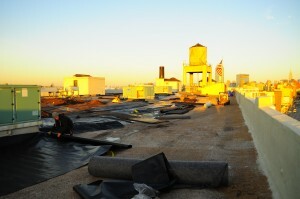 Tenth Acre is looking to conquer not only ground spaces, but rooftop ones as well. Daisy Bow is a doctoral student studying food in contemporary French literature at New York University in New York, NY. She may be reached at daisy.bow@gmail.com.